Posted on July 12, 2018. Subscribe to our blog by email. 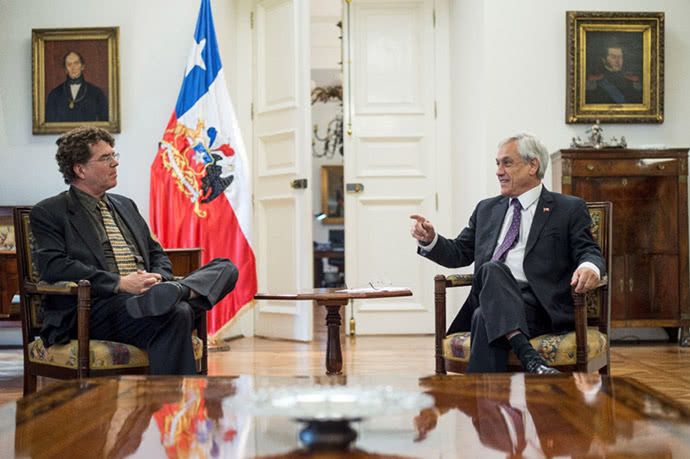 I recently had the opportunity to sit down with President Sebastián Piñera of Chile who was interested in hearing a global perspective on impact investing and discussing ideas that Chile could consider to promote both foreign and domestic impact investing. President Piñera was recently elected to his second term, so he is no stranger to the importance of adopting good policies to address challenges faced by Chileans. Not surprisingly, he is an impressive man, with a keen knowledge of affairs local and abroad, and a clear agenda to advance Chile. An entrepreneur himself and with a PHD in Economics from Harvard University, President Piñera is well aware of the relevance of private and public contribution and alliances to provide solutions to social problems, both from a market based perspective and public support. During his first period as president of Chile (2010-2014), Chile GDP grew 5,4%, unemployment rate was at 6,9% , minimum wage increased by 27% and over 1 million new jobs (total population is 18 million) were created. In his second (non consecutive) term as president (2018-2022), Mr Piñera focus will be in early stage education, especially targeting holistic solutions to improve the lives of the youngest segment of society, which shows his alignment with long term solutions to core social needs. Chile has free trade agreements with 85% of World GDP and 63% of global population (4,600 million people approx). Chile’s economic freedom score is 75.2, making it the 20th freest economy in the world according to Heritage 2018 Index. In preparation for this unusual opportunity, I spent a good bit of time thinking about both short and long-term pragmatic actions that could accomplish that end. I also reached out to a number of associates around the world who were kind enough to take the time to share their views and experiences. Over the course of my research and discussions with associates, I found enough policy-related topics to support 2 or 3 posts on this topic. In my next posts, I’ll focus on the topics I did not have the time to discuss in our meeting. In my discussion with President Piñera, I decided to focused on two primary areas, one to incentivize local impact investing, and the other to engage millennials. My first proposal was simple: Chilean tax code is very favorable to local investors who invest overseas through a “feeder fund” or similar instrument. In essence, they can defer taxes on earnings for a very long time. At Capria, we are creating such a feeder fund in partnership with LarrainVial, one of the most respected asset managers in Chile. The feeder fund will invest into our global fund, providing diversified access to some 200 fast-growing and impactful businesses in other emerging markets. With the positive reception we’ve received to this structure, we’ve learned just how desirable this structure is to investors in Chile. My proposal: make it easy to apply the same tax benefits to profits from certified local impact investments so that local family offices and institutions are equally incented to invest locally for impact as they are to invest offshore. There is no doubt as to the interest in global impact that we see in Chile – let’s activate it locally as well as internationally. As to how to “certify” what is impact, see below. My second proposal was in recognition of the trillions of dollars globally that will be transferring from boomers to millennials over the coming decades. Most millennials are not yet wealthy enough to be in US parlance an “accredited investors”, or more generally to have sufficient funds and knowledge to participate in complex private equity financing which is the common access point for nearly all impact investing. Another means is required to engage them from a financial sense. My proposal is to allow certified impact funds to accept up to some modest percentage (say 10%) of their fund from “smaller” investors, with a maximum investment of maybe $10k from any one of them, without having the engagement of such investors cause the fund to be considered a “public” fund. Further, I propose that when employees invest in certified impact funds, their employer matches their investment by some percent (maybe 3%, like how large US companies match 401k contributions), potentially using funds coming from their corporate social responsibility budget. More on that below. What Qualifies as a Certified Impact Fund? Both proposals above raise the obvious question: how do you determine what is and is not an impact investment? The answer requires judgement, and the good news is that Chile has a means to exercise such judgement at hand already, with its very active development finance institution called CORFO that invests in companies and funds that increase entrepreneurial activity in Chile. Since CORFO invests in pretty much every quality investment fund in Chile, they could apply a rubric based on global standards for impact investing and label each fund as “impact” or “not impact”, in the context of the known needs and challenges of the Chilean population. From my outreach to other influentials in the impact community, I learned that there is already a significant effort underway across multiple governmental ministries and NGOs to embrace some of the global best practices in impact investing to address endemic issues in education and other areas in Chile. I’ll wrote more about what I learned and about other ideas from around the globe in my next post. My colleague Juan Luis Palma who helped arrange the meeting with President Piñera has also been teaching me a bit of Chilean history. We met at the presidential palace in Santiago, called La Moneda, which is beautiful and full of historical paintings. The picture on the wall behind me is of Don Andrés Bello (November 29, 1781 – October 15, 1865). Latin American humanist, diplomat, poet, legislator, philosopher, educator and philologist, whose political and literary works constitute an important part of Spanish American culture. Bello is featured on the 20,000 Chilean peso notes. He was generally reckoned to be the foremost intellectual amongst opponents of the Spanish empire in the Americas after the Napoleonic Wars. One of Bello’s most famous accomplishments was his promulgation of the 1852 Civil Code of Chile. He worked on this Code for twenty years, and it was later adopted by 6 other Latin American countries. The Economist’s section covering Latin America was named “Bello” in his honor. Originally posted on Capria website, June 24, 2018.